The party were resting up in Dacien's retreat, when Mendel felt the hairs prick up on the back of his neck. Dacien's detect scrying was trigger, as the image of a strange exotic woman appeared in his mind, peering over a pool of rainwater, and clutching two red-stained cobblestones in a blood-soaked rag. She was idly watching Mendel through her sensor, biting her lip and playing with her hair. A symbol hanged around her neck that Dacien recognised - as an unholy symbol of Talitha, the entropic immortal of thievery, murder and lies. She eventually spoke, and only Mendel heard her invite the party to Porphyry House, a little petulant they had not been already. On returning to the city, Antony went looking to buy some real estate. He examined the district around a tower they believed to belong to Kedward Bone. The first house he knocked on was answered by an old gnomish woman who mistook them for body part sellers for the golem business. None of the properties were particularly lavish and well built. Eventually, they found an abandoned slop house come drug den, and started making it their own. 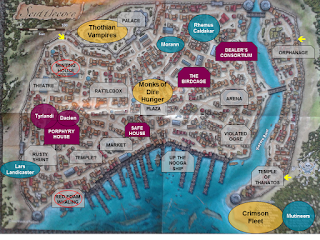 However, as the party entered the city to plan their attack on the Harpies, they saw signs they might be being watched, as tiles fell off the roof of a nearby house. Outside Red Foam Whaling, Mendel had been patrolling the docks, trying to act nonchalant as he kept an eye on the outside of the building. He hadn't spotted the figure in the shadows opposite the abandoned structure, who ducked back into darkness and cast invisibility. When Mendel heard and saw the effect of Gerald's blade barrier cause the whole building to shudder, he activated his fly spell and dashed to the roof. Spotting the large man-spider attacking Faldak and Antony he let loose a volley of arrows. The invisible figure spider climbed up behind him and sunk a dagger between his ribs, narrowly missing Mendel's spleen. 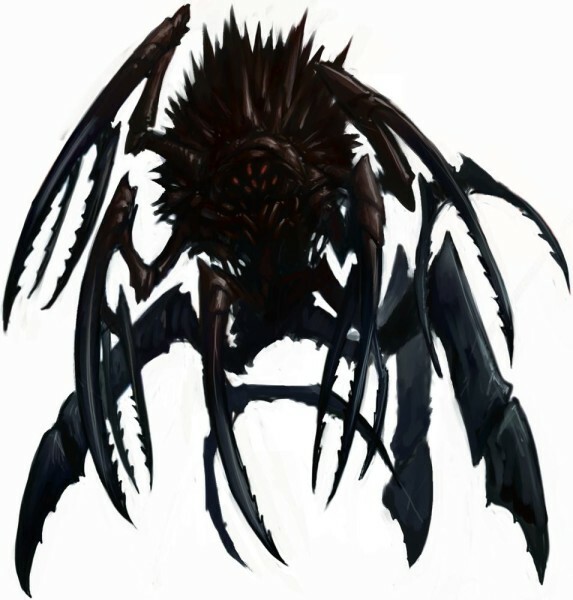 The large beast below saw the new threat and reacted - two images appeared; one drew upon a psionic aversion to instil a morbid allergy to spiders in those around him, the other charged at Mendel and stabbed him with the scimitar. 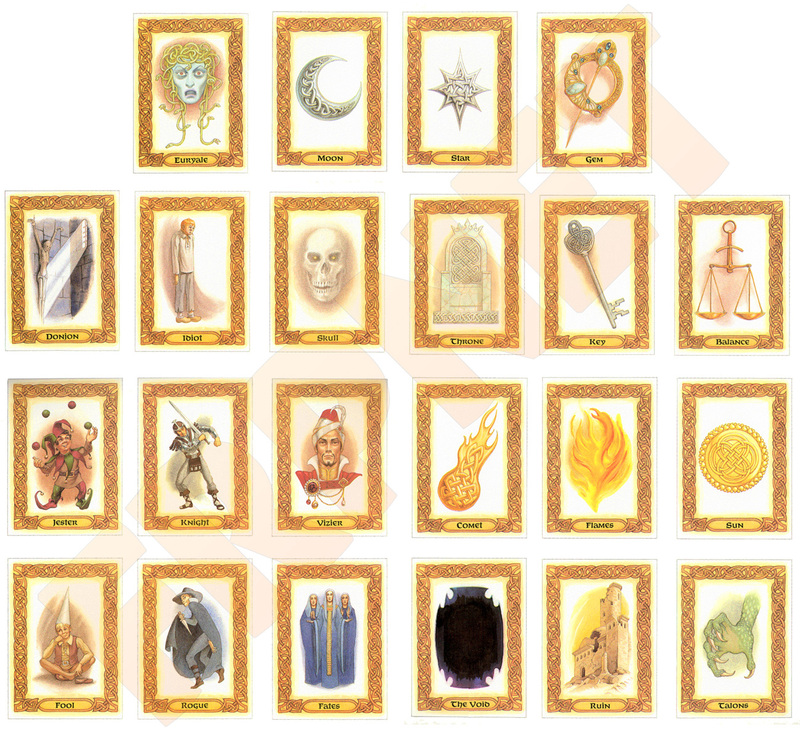 The images coalesced into one form towering over the archer. Zhedd started summoning a band of air elementals to try and grapple the foes, and the rest of the party moved to try and join the battle on the roof. Gerald took a chance and called down a flame strike that engulfed the trio fighting on the roof, hoping Mendel would evade the damage. He did - but the foes didnt as they were bathed in fire, which narrowly missed Felix as Dacien telekinesed him to the roof. The final assassin was grappled by the elementals but had enough breath in him to utter the word he needed to dimension door away. The party recovered and next day stopped off at the Rusty Shunt. Lars said he'd just heard that Zimon's body was hanging in the plaza. Tyrlandi, he explained, was a bit of a mystery, but that any visitors would have to per her the proper tribute. Zhedd scryed for Harliss, clutching the earring as he leant over the pool. A view of a woman, lit by the rising sun, unconscious and badly beaten and dehydrated, lying on a straw-strewn cage floor. This reminded the party of a structure they had seen in the city - the Birdcage, run by the harpies that called themselves the Sister of Lamentation. The party toyed with visiting the Birdcage or Tyrlandi first - and fearing that Tyrlandi may have double-crossed Harliss, decided to explore the Birdcage first. They wandered through the city and found the crooked spire - its walls covered in graphic lewd images of debauchery, pain and pleasure. They mulled around outside, indecisive as Zhedd eventually asked some gulls to fly and and peer in the glass top - but they couldn't see enough to report. Felix caught up with one pirate patron as he was leaving and persuaded him to share some of the details - the brothel was not for the faint-hearted, but that if Felix had the stomach for it, 'Vivisecta' was the one to ask for. Walking through the city, Felix spotted a passer by try to leave a scrap of paper in one of his colleague's pockets. He grabbed the pickpockets hand and shooed them off - it turned out to be a warning that 'one of the party was not who they seemed' and to come to the Deacon's Aria at midnight to find out more. This building turned out to be a theatre, in the grand guignol style, putting on bloody and visceral displays including a striptease and a play about a doppelganger. The theatre owner, Abethany, was intrigued by the party's tale and interested in having them as consultants to make some of their displays more technically convincing and graphic. 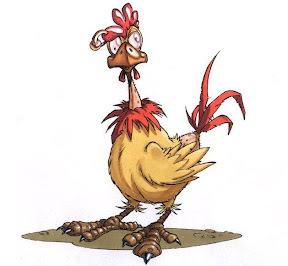 Gerald mooted the idea that the party could hire out some of the actors for a private job, and suggested returning once the plans were more concrete. The party remained in two minds about what to do next, so to stall for time went looking for a suitable 'gift' to give Tyrlandi. They went to the market, but left empty handed after Mendel insulted the perfumer, so went to the docks looking for other ideas. It seemed a city where pirates came to relax rather than sell off their goods, but a word in the right ear might reveal someone more desperate to be rid of their spoils.They were stopped by a nervous street hustler with a large coat lined with trinkets he tried to off-load to the party. As the party were distracted, some invisible assassin slipped form the crowds on the docks, along with some disguised leaping demons. They pounced on the party, Mendel and Faldak receiving knives in a variety of vital organs, and the demons tried to abduct the others. Antony laid low an assassin with the Cymric Dirk - and was struck by the mental image of the minting House, the assassin's hideout and heart of the Eighth Coil, as its deepest secret was revealed. A passing wizard happened to see the shadowy dagger in action, and uttered a short prayer before attacking the party and trying to claim the dagger for himself. The party later found a holy symbol of Masauwu on him, confirming his interest in that immortal's unholy artifact. The party fought off the attackers in quite public display of power that caught many bystanders in magical effects and drew a larger crowd. Antony was abducted by a leaping demon to an abandoned warehouse. Before the demon could pummel Antony into the ground, he used the bracelet of friends to call Mendel to his side, who dispatched the demon with ease. They left the warehouse to ifnd themselves in the eastern quarter of the city near a dark austere orphanage. Back on the docks, Zhedd's solid fog and Dacien's wall of force kept people at bay long enough for the party to gather themselves, the loot, and escape back to their hideout. They resolved to rest up and return in the morning. They had three targets - Tyrlandi, the Sisters of Lamentation, and the Eighth Coil. Finding a gift for Tyrlandi was to be first on the list. 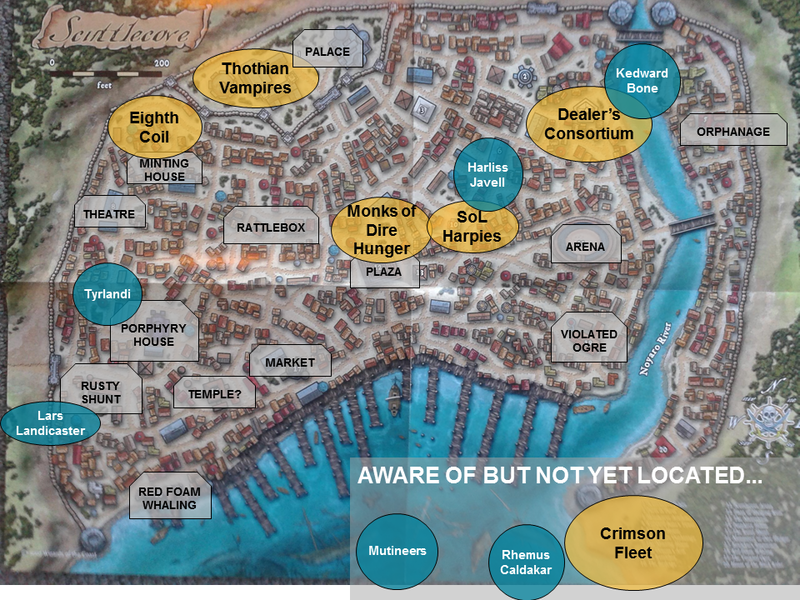 The vampires behind the wall of force retreated, calling out about the party's powers and resources and alerting their allies to Mendel's blessed weapons. A deep resonant voice called out "Introduce them to the Eviscerator Scarabs!". 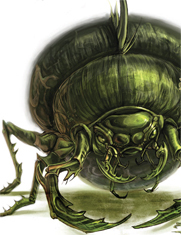 Two giant beetles came down either side of the entrance hall, their black carapace glistening with a sickly green ooze that seeped out from every joint. Their legs were attached to cords of twine that linked them to a web of broken glass and bone that hang form the ceiling.As they waddled forward, their mandibles clacked together with a deep echoing hollow thud, that reverberated around the party's skulls. Felix managed to counteract the effect with his bardsong to allow the others to fight off one beetle whilst the other was trapped behind the wall of force, being mauled by two of Zhedd's summoned crocodiles. Gerald prepared to face what was behind the double doors, and as he saw them start to open, summoned a blade barrier in their place. Unfortunately he was so focussed on the spell, he didn't have time to rest to the fact the doors were being flung off their hinges into the room, and caught a flying lump of oak to the side of the head. The wall had barely come into existence before a portion of it vanished, and a group of the shabbily-dressed vampires emerged, led by another, agile one in Thothian dress. "Give us the promised one!" they cried, as they crowded in on Dacien. Dacien's disintegrate spell made short work of the head vampire, but the others tried to grapple him away. Zhedd swept down on Banshee to pull him away from the mass of flailing arms just in time. Another voice echoed in the party's heads - this time telepathically; a thin whispering paranoid voice like dry papyrus. "Who are you? You're here for me? You know my name, don't you!" it fretted. The party ignored this interruption and pressed their advantage in the battle, only to spot a pale evil-looking beholder lurking in the remains of a small ball room, floating above a pit thick with purple, throbbing webbing. Various party members succumbed to it's charm rays but avoided the other effects, as it came into the room. Zhedd caught it within a cloud of solid fog, which when uncovered revealed no sign of the beholder. The party then prepared to take out the remaining eviscerator scarab behind the wall of force, with Dacien clearing the obstructing solid fog with an anti-magic field. As the wall dropped, the party let loose their attacks, but Dacien was caught out by the on-rushing beetle, and sliced in two by its wickedly sharp mandibles. 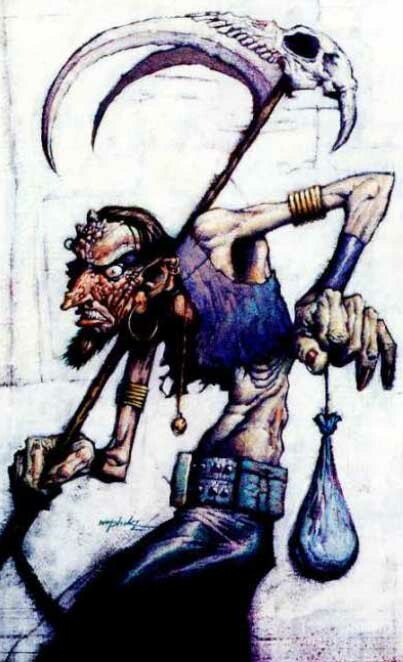 The party found time to bring Dacien back, noting that they were low on components for further raise dead spells, and Gerald began the casting to remove the charm effects from the party. his casting was interrupted by the antimagic ray of the beholder, re-materialising the other side of the blade barrier. After fighting to another stand-off, the party decided to regroup in daylight in the palace grounds. 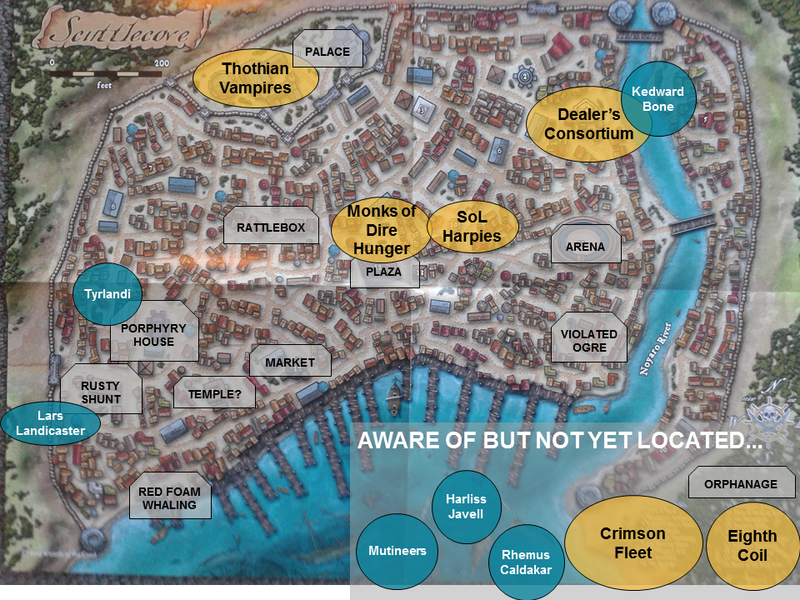 Quite crowd of locals had gathers to view the commotion - and Zhedd had spotted two harpies that had flown over to investigate, then abruptly disappeared. The locals quizzed the party on who they were working for and what they were doing, surprised to see someone brave and return from the palace. A quintet of cowled monks, the skinless lower halves of their faces glistening sickly in the sun, watched the party and followed them over the palace wall. They demanded a tax for trespassing from the party, which was paid, but didn't stop the party proceeding, instead going ahead of them into the palace. The party stormed this again, to face the beholder and the monks, who were quickly dispatched. The beholder tried to fend off the party's frontal assault, only to be caught out by Antony leading Dacien over the roof and in through the ceiling. Gerald caught the beholder in a flame strike which was also powerful enough to burn off the strange purple webbing. A second one destroyed the beholder, sending its gaseous form down through the tunnel to the area below. Trying to press their advantage, the party hurried after, but without preparation blundered into a trap that set off an unholy keening wail. Felix, Antony, Lenny and Faldak fell prey to the scream and their bodies, stiffened as they died of fright, fell into the pit. Dacien telekinesed them back out, as a female creature, her lower half that of a spider, emerged muttered "I think you best leave". The paranoid voice was heard again, and when Mendel asked who it was, it answered in a trembling voice "yes, you would want to know." They asked about Dacien being the 'Promised One', and the spider-lady replied "Not for what he is now, but for what he will become. It is his destiny." The party fled to the surrounding wilderness to recover and raise their friends, hiding in a secure shelter as they plotted their return to Scuttlecove. Back at Fort Gerard, Stephen was left to use the electronics he had salvaged to begin repairs to the reactor control systems, whatever they were. Faintly Macabre mentioned to Dacien that she thought Stephen’s strength and resolve would continue to weaken due to his proximity to this strange power source – the bloodroot might stave off his craving for now, but would only ever be a temporary effect. 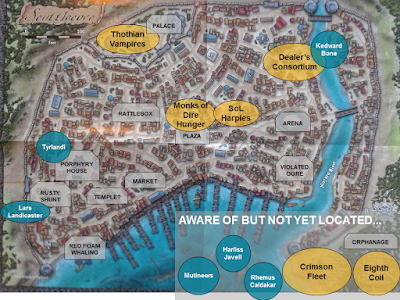 Faintly expressed an interest in adventuring and considered meeting the party in Farshore in the future. Faldak and Mendel took guard duty on the roof of the fort, whilst Zhedd scryed for the Shadow elves to no avail. After a day’s rest and recuperation, the party teleport back to the capital of Emerond. The capital Izmira was busier than on the party’s last appearance, but as the green-skinned Emerondian’s spotted the party, they dropped to their knees and bowed their heads in hushed whispers. Keen ears made out the phrase “Keeper of the Heart of Emerond” being repeated, and most eyes were following Gerald. The king greeted the party warmly, having heard from his gardeners that the deterioration of the plants had been halted. In the palatial baths, their heads anointed with scented candle, the party reported back (but kept the detail of Stephen’s existence silent) and shared their concerns that the Shadow Elves might return. The king agreed that a small trusted honour guard could be placed under Gerald’s command at the fort – he seemed to accept without question Gerald’s status in the kingdom. By way of thanks, we rewarded the party with several items from his armoury – plant-based weapons, armour and trinkets that might aid them on future quests. He agreed to allow the Church of Asterius to trade for their unique liquor, and also small amounts of the weapons. The party spent much of the next few days travelling between Farshore and Sasserine, resting, resupplying and catching up on progress. Ji’s monastery was well underway, Mendel checked in with the Church of Asterius and Manthalay to discuss shipping additional cargoes to Farshore (Aloysius has ideas to fleece all parties involved, and set about sourcing appropriate goods). The alchemist had identified the fruits from the Isle of Dread as potent hallucinogens, and thought they could find value in the drug trade or development of alchemical gasses. Antony had Nosmo ferry passengers between Farshore and Sasserine, and also start spreading the word about the new route and port to other ship owners. Dacien asked the Temple of Ixion to send acolytes to Farshore, and teleported some there directly. Zhedd picked up his gloves for the Witchwardens, and then they were set to go. The next stop was to call in the favour from the Church of Asterius to get the party introduced to King Koryn of Ne’er-do-well – so they could follow up on their leads to track down the shadow pearls in Scuttlecove. 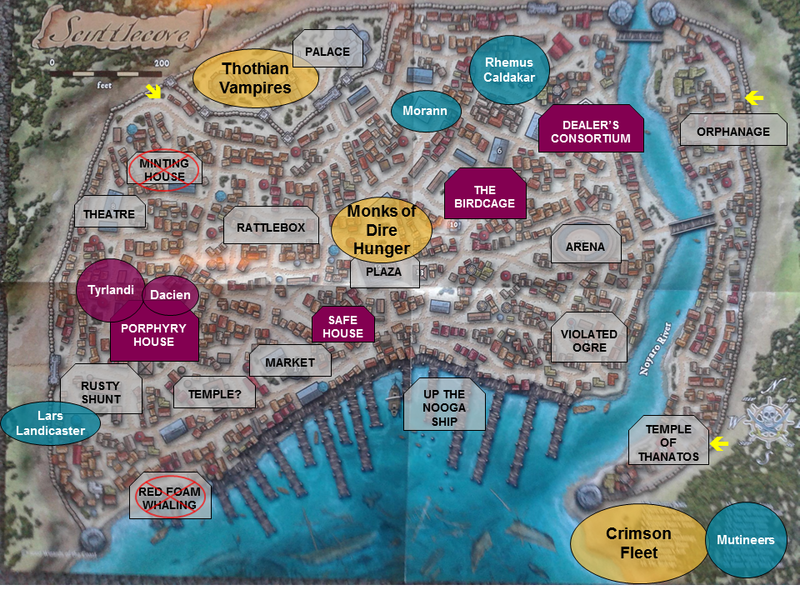 Dacien teleported the group to Crossroads, the capital, and went from there to an inn named the Inappropriate Eel. Crossroads was an odd city – beautiful buildings and marble statuary lined the once fine streets, but now were covered in graffiti, defaced and anything of value broken off and sold on. Half the populace were wearing featureless masks and very little eye contact was being made. 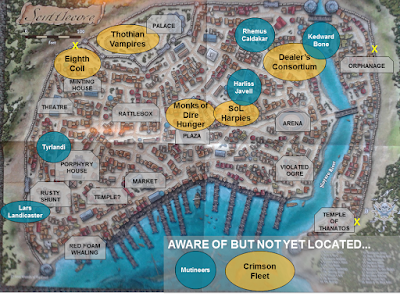 The party found the inn on the harbour front and, leaving a special coin with the innkeeper, waited to be summoned. Ne’er-do-well: originally a kingdom of two islands called Artesia and run by artists, poets and musicians, mismanagement caused it to fall into ruin and become a home for the unfortunate, desperate and criminal elements. Koryn worked to shape this into what he called his ‘anarchy’ – a state where anything is legal, as long as it causes no physical harm, and where people are free – as long as they acknowledge Koryn’s rulership. He was proud that this was a place where people could find whatever they wanted – at a price. The masked visitors were those wishing to keep their presence, motives and identity secret. Scuttlecove: a small port on the volcanic swampy island of Lesser Ne’er-do-well, Koryn let his former travelling companions and pirates Kedward Bone and Rhemus Caldakar take up positions there. 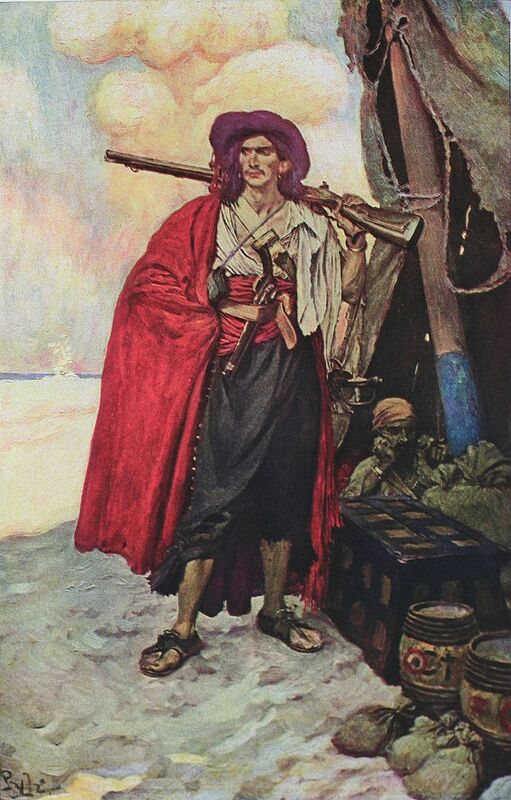 Kedward was a dashing pirate who fell to the ravages of a disfiguring disease, and became a recluse with strange predelicitions and drug dealing. Rhemus was a gnome sorcerer that has a business selling body parts. About 10 years ago, a group of exile Monks of Dire Hunger from the (Egypt-like) nation of Thothia petitioned Koryn for safe harbour and he allowed them to take residence in Scuttlecove. They built a palace, but then vanished a few years ago, leaving a haunted building behind. A sect of powerful Bellisarian wizards used to run a brothel in Porphyry House, but were ousted by a mysterious woman calling herself Tylrandi – who was seldom if ever seen. A group of coin skimmers, who make a living shaving gold off coins, named the Eighth Coil, had also become quite rich and powerful in the city. What had raised Koryn's concern was the arrival of the Crimson Fleet, a powerful group consorting with demons and operating from a magically hidden base near Scuttlecove. 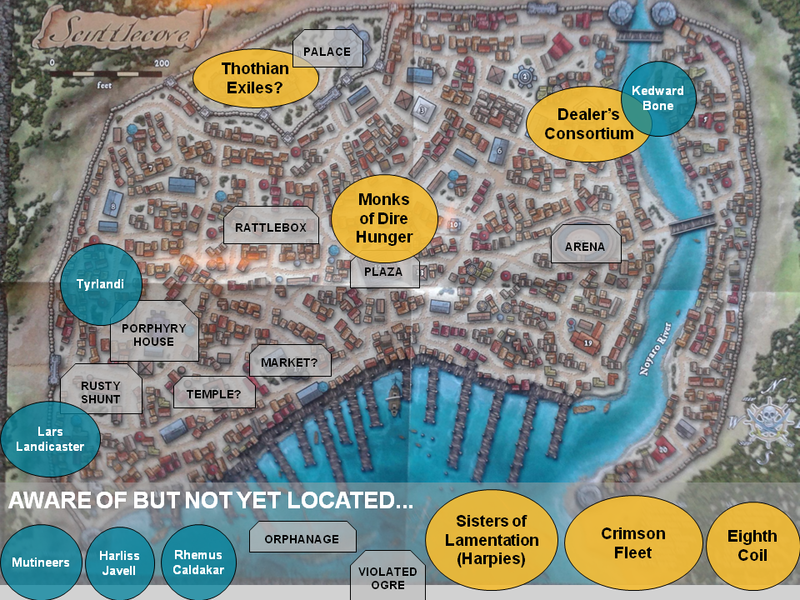 Now the city was on the brink of civil war between the factions and Koryn feared for his reputation with the Alphatian Empire if this become too unruly, and also that one power group might seek to rival him. He wanted to put down any thoughts of rebellion – at arm’s length with nothing to be traced to him – by having the party investigate what was going on in Scuttlecove and tip the scales in one groups favour as they saw fit. Koryn wanted his anarchists in control. So, if the party sought out the Crimson Fleet’s hidden base of operations, and took them out, Koryn could see stability returning. And he was willing to offer the party the resources of Ne’er-do-well, the favour of a king, in return. Koryn left at that point, and Felix, a rakasta agent, entered to brief the party further. He had been sent by Koryn to find Zimon Alvaneer, Koryn’s trusted spy in the city, who had disappeared without trace. When Felix got to the city, he found out the Protectorate, Zimon’s network of agents loyal to Koryn, had been killed to a man. He returned quickly to gather a larger group and help him look into this. One potential port of call in the city was the tavern Rusty Shunt, run by a former pirate Lars Landicaster, who had a noble heart. The party were shipped in Scuttlecove and saw it for the bustling depraved shithole it was. They saw demonic apes, robed disfigured monks, harpies and other creatures amongst the bustling, fighting crowds. All eyes were on them as they arrived, sizing them up as potential marks. They made it to the Rusty Shunt, but Mendel’s questioning put Lars on edge, and he didn't reveal much. 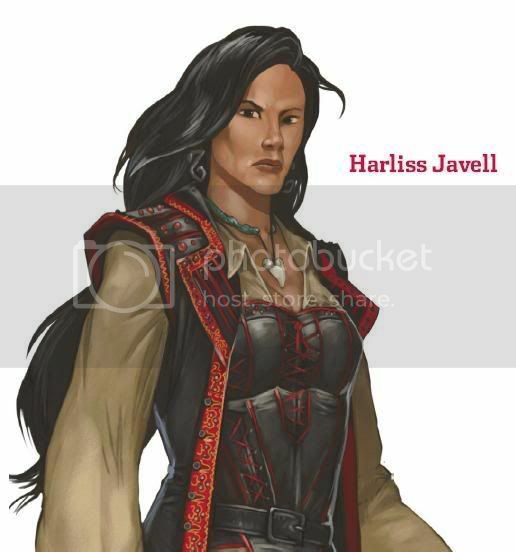 Anthony spoke to the patrons and heard more about the city – apparently dashing female pirate that the party thought might be Harliss Javell was seen asking questions, and might be linked to a group of mutineers from the Crimson Fleet. Lars warned Antony off asking too many questioned, and Felix sensed some regret behind his words that maybe others asking questions in his care hadn't fared well. 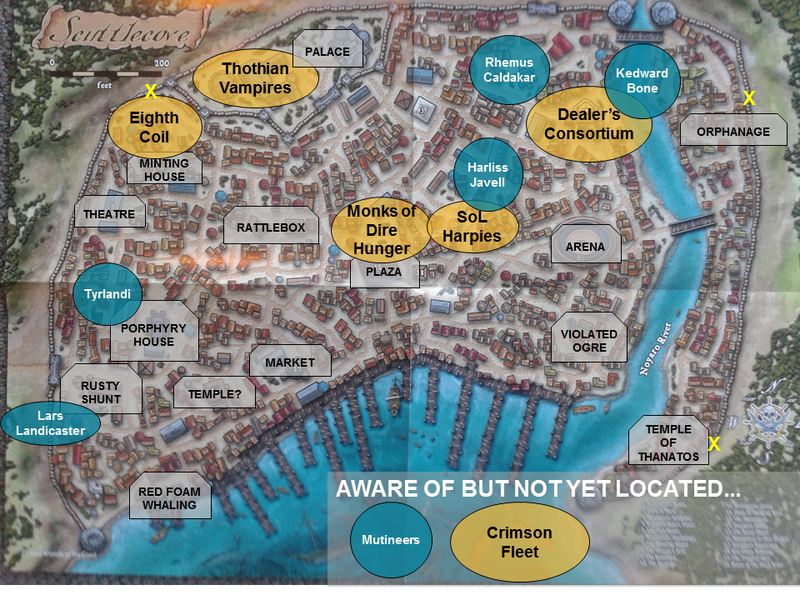 The party decided to head through the thronging streets and explore the ‘haunted palace’ first, and in broad daylight (via the Plaza of Hanging Ruin, a mass crucifixion site run by the monks) went over the wall and broke in through the front balcony. In the entrance hall, decorated in Thotian style, they were attacked by shadows that lay hidden in large canopic jars. A vampire entered and told them they were trespassing, and left as swarms of other vampires attacked from either side. Dacien sent an arcane eye after the head vampire, but it stopped working once it got through the keyhole. As the party fought off the vampires, Zhedd and Felix who had been waiting outside on guard, arrived to warn them that a crowd was gathering by the gates outside.